With a futuristic design and high-performance scanning technology the MS9540 VoyagerCG is equipped with all of the features of the MS9520 Voyager with the addition of Metrologic's exclusive CodeGate. CodeGate is an intuitive scanning system that is ideal for all scanning applications including Point-of-Sale document processing inventory and menu scanning just to name a few. CodeGate works hand in hand with Metrologic's automatic-triggering scheme. Simply present a barcode to the scanner, place the high-visibility laser line on the barcode then press the CodeGate button to transmit the data to the host system. It's as easy as one two three! 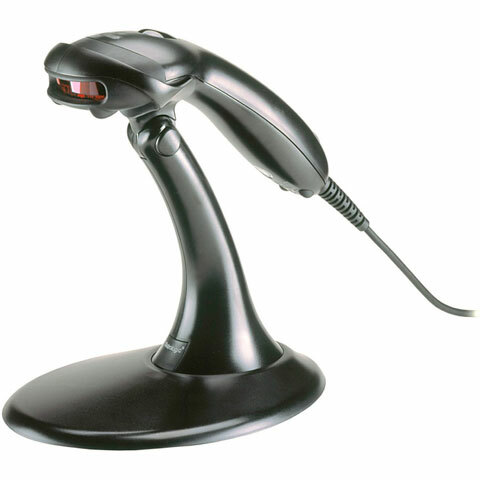 Equipped with both In-Stand and Out-of-Stand operation Voyager can be used as both a handheld and fixed projection scanner. While resting in the stand the CodeGate button is deactivated making VoyagerCG a presentation scanner. The feature-packed Voyager comes equipped with PowerLink user-replaceable cables and power supply MetroSelect one-code programming MetroSet Windows-based software configuration utility Bits n' Pieces data editing utility and an Electronic Article Surveillance (EAS) option. With aggressive performance and lightweight design VoyagerCG is far and away the most advanced scanner on the market today! The Metrologic MK9540-32B41 is also known as Metrologic Instruments	MK9540-32B41	or MK954032B41	.